Home to a wide range of flora and fauna, Nagaland is called the falcon capital of the world. With Kohima being the capital and the explicit specialities like the Mount Saramati, the highest peak and the vivid socio-cultural background with sixteen major tribal groups, Nagaland is a state with a lot of raw talents which is why more than half of the state’s GDP is contributed by the service sector. The people indulging in service works are large and this creates a chaos in transport. If you have found a rental accommodation closer to your work space where you can reside in, then it is time for you to create a rental agreement in Nagaland. A rental agreement is a contract that is signed between the landlord and the tenant when the former decides to rent the property to the latter. It is very natural for one to be confused about what type of a rental agreement is to be created while renting a property. There are three different types of rental agreement. If you are a student or a working individual looking for a rented apartment to stay, then create a rental agreement for 11-months. An 11-month rental agreement is valid only for a short-term and could be renewed if both the landlord and the tenant wishes to do so. This contract is the easiest to be created as it does not mandatorily require a registration. Your house is uncomfortable? Move out of there and look for a new, bigger apartment. But do not forget to create a long-term rental agreement. This contract is made for residential purposes and could be for a time period of 1-5 years, 5-10 years, 10-15 years or more. If you are businessman planning to set up a firm in a new place, create a commercial rental agreement. You can customise the contract as per the requirement of the business. Not just in the business field, but all of us have our own preferences. Also, none of us would like if any kind of disputes arises in the future. So it is essential that you personalise your lease agreement by adding certain clauses, a few of them being unavoidable. A list of them is given below. Accurate details: The contract should have accurate details of the landlord, the tenant and the property to be rented. Rent amount: The rent amount should be mentioned in the document. This serves as a protection to the tenant if the landlord decides to increase the rent unethically. Security deposit: This is the amount that the tenant pays to the landlord at the beginning of the stay. The landlord is liable to pay back the whole amount to the tenant when the contract terminates. Notice period: If you are planning to move out from the place, then you will have to inform the landlord the same in advance before a certain period of time. This is called the notice period. Are you a person who loves pets? Do you have people visiting you all the time? Or do you have any other preferences, then feel free to mention them in the lease agreement and customise it according to your preference, if the landlord also agrees with it. While creating a rental agreement, the other important thing that would confuse you would be the stamp duty rates. A stamp duty is the tax levied on the document to make it legally valid. Make sure you have used the correct value stamp paper to create your rental agreement. In Nagaland, the stamp duty rates are decided as per the Indian Stamp Act, 1989. Personalise your contract by adding essential clauses. Print it on a stamp paper of the recommended value. The contract is to be registered at a Sub-registrar office. The Nagaland Ownership And Transfer Of Land And Its Resources Act, 1990, is the primary law governing the formation of rental agreement in Nagaland. It is not necessary to notarize a rental agreement. However, registering your agreement is an extra validation to the details that are given in it. In case a dispute arises in the future, the legally registered document would be preferred over a non-registered document. However, getting your document registered is a tedious and tiresome process, especially the wait at the Sub-registrar office. Why So Much Trouble When You Can Create A Rental Agreement Online? 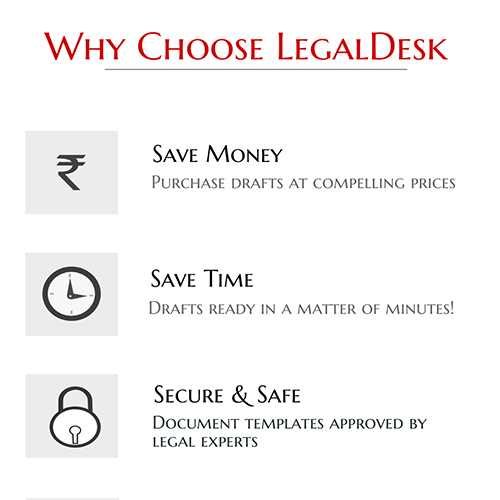 Creating a lease agreement online is only a matter of few minutes with the help of LegalDesk.com. All you have to do is to enter the details of the landlord, the tenant and the property to be rented. Even if it’s a twenty-legged table you want, personalise your document by adding clauses you find unavoidable. Print the document on a stamp paper of the recommended value and get it signed by the owner, tenant and witnesses. Creating a rental agreement online is a simple process. This would make your work much easier and save you a lot of time. There are also several other provisions that we provide such as name change procedure, affidavits, the power of attorney and several start-up packages which would also be of excellent use if required. There are 0 comments on "Rental Agreement – Nagaland".